A former Northwestern professor and his accomplice charged in the stabbing death of a Chicago hairstylist will have their hearings scheduled together as their cases proceed. Attorneys for Wyndham Lathem and Andrew Warren agreed on Tuesday to schedule hearing dates together following a request from Cook County Circuit Court Judge Charles Burns. “It is my preference that these cases be kept together, that they are not held on separate court dates,” Burns said. Warren’s public defender Kulmeet Galhotra had previously requested that hearings for the two suspects be separated. But on Tuesday, Burns spoke with attorneys for several minutes in chambers prior to Lathem’s hearing, and said the sides had agreed to hold future court dates on similar dates. Even so, it remains to be seen if the two will actually be tried together. Burns wasn’t present at Lathem’s arraignment in September, but said he will be the trial judge moving forward. The two men have each pleaded not guilty to six counts of first-degree murder in the death of 26-year-old Trenton Cornell-Duranleau. Prosecutors have claimed Lathem and Warren carried out a “sexual fantasy” in killing Cornell-Duranleau, who was found stabbed more than 40 times inside Lathem’s River North apartment on July 27. Lathem and Warren each face anywhere from 20 years to life in prison if convicted. The suspects had been communicating for months through an online chat room leading up to the killing, according to prosecutors. After the killing, they allegedly fled the state before eventually turning themselves in to California authorities more than a week later. An autopsy listed Cornell-Duranleau’s cause of death as “multiple sharp force injuries” and noted dozens of stab wounds to his chest, back and neck. He was also found to have alcohol, amphetamine and methamphetamine in his system when he died. Attorneys on both sides are continuing the discovery process. On Tuesday, prosecutors handed over grand jury transcripts and more than a half dozen DVDs containing witness interview videos as well as surveillance and police body cam footage to the defense. Lathem, 43, was regarded as an expert researcher on plague-causing bacteria, while Warren, 57, worked as a senior treasury assistant at Oxford. Both have since been fired from their respective universities and remain held without bond at the Cook County Jail. Warren has a previously scheduled hearing Wednesday, and Lathem is due back in court Nov. 28. 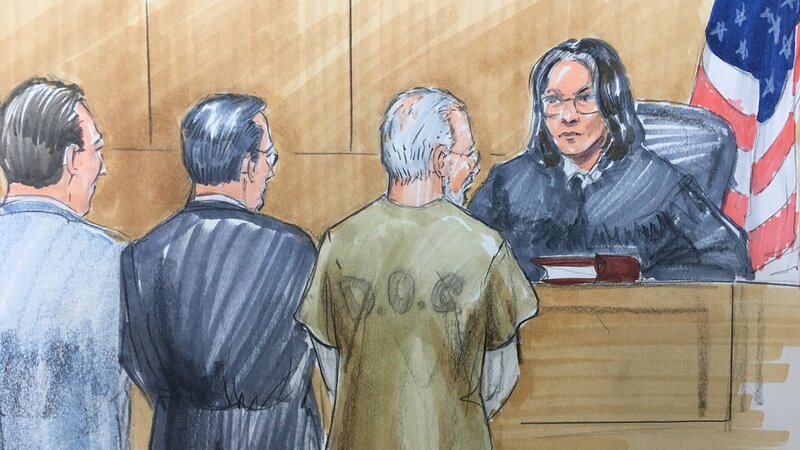 Sept. 27: “Everything is unusual about this case until we hear more,” a Loyola University Chicago criminal justice professor said regarding Wyndham Lathem and Andrew Warren – two former university employees accused in the stabbing death of a Chicago hairstylist. Sept. 20: Wyndham Lathem and Andrew Warren each face six counts of first-degree murder in the July stabbing death of a 26-year-old man inside Lathem’s River North home. Aug. 7: 42-year-old Wyndham Lathem, who’s accused in the murder of a 26-year-old Chicago man, made his first court appearance on Monday.